I always know what I am getting into with a Gary D. Schmidt novel: kind teachers, abusive fathers, a Maine setting, and several instances that make me bawl my eyes out. Even though I know this, I started reading Orbiting Jupiter as I was going to bed, and then ended up reading the whole thing. That's the other thing I know I'm getting from this author: an amazing story of resilience. Jack is twelve when his family changes forever by fostering Joseph, a fourteen-year-old who has had an unimaginably difficult life. For Joseph, the only bright spot is knowing he has an infant daughter named Jupiter. He is determined to love and care for her, despite the odds. This comes at great sacrifice and tragedy. This is a fast, slim read, but should be categorized for young adults, as it is devastatingly sad. It would be a tough sell with my current students. 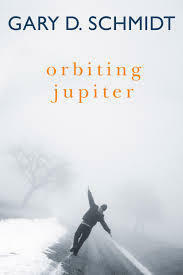 I think Orbiting Jupiter might be a YA book that is really better for adults, as a reminder to be kind to teenagers. I loved it.